Returning from the DL is sometimes a struggle, and sometimes its rejuvenating. Where some return and struggle to get back to form, other players start hot, as if the break put them back at the top of their game. With his strong return, Mitch Maier must be feeling great. 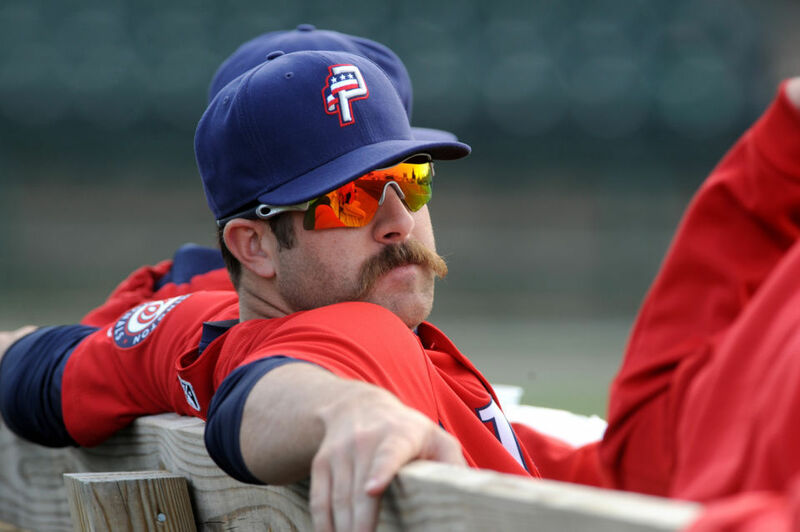 During the week since he rejoined the Pawtucket Red Sox (AAA), Maier has hit .353, including 5 runs, 6 rbis and 2 home runs, while managing 4 walks and a stolen base. His average for the season is now .333 — among the best in the league, except for the fact that he hasn’t enough plate appearances to make the stats lists. 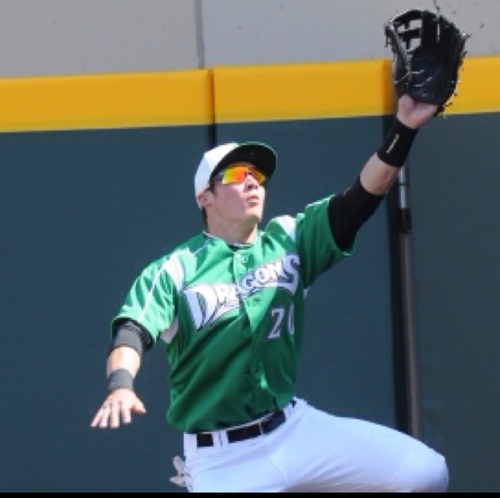 The Dayton Dragons’ Jeff Gelalich (pronounced JELL-ah-litch) is pretty good. Among the various Mormon prospects inthe minors, he now has the best batting average (although he is playing in the single A Midwest League). He also has scored 31 runs, walked 21 times and stolen 12 bases in 172 at bats. So should he be promoted to AA? Unfortunately, he’s not so good that he is on the Midwest League’s leader boards, which might be a signal that he should be promoted. But he might be good enough for promotion, if there was a need. And it is the “need” part of the equation that is hard to judge in the minors. If the players in AA all have more potential, surely the management won’t send them down to make room for Gelalich. And those players may be in AA for the same reason — there are already strong AAA prospects, who are also waiting for something to happen to make the majors—in this case the Cincinnati Reds. Unfortunately, its not just about how good you are, its also about other players and how well they are playing. So everyone in the minors waits and watches and tries to play their best so that when the need is there they can be promoted. 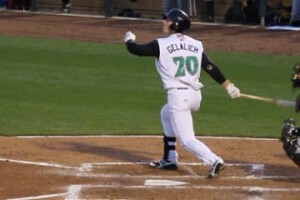 Still, with Gelalich’s numbers, especially with his .360 average last week, a promotion to AA later this year seems possible. 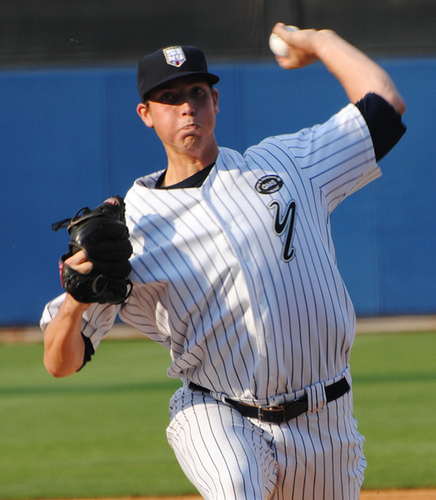 Yankees prospect Nik Turley got the call to move up a level last week, from the Trenton Thunder (AA) to the Scranton/Wilkes-Barre Railriders (AAA), and although his pitching has been somewhat mediocre this year (4.46 era), he rose to the occasion. In a 6-inning start Turley gave up just one run and two hits (1.50 era), but ended up with a no-decision. But, despite a great performance, Turley was sent back to AA this week—apparently the Yankees don’t need him in AAA yet. Turley pitched for the Yankees in spring training and is on the major league team’s 40-man roster, making him one of the more likely prospects to be brought up. But overall Turley’s AA performance says that he isn’t quite ready yet. 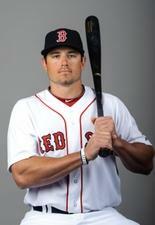 He isn’t the only Mormon in the minors on a major league 40-man roster. 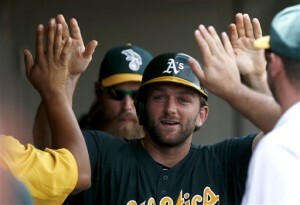 Oakland A’s prospect Shane Peterson, who is currently with the AAA Sacramento River Cats, is on the major league team’s 40-man roster and has already been brought up to the majors briefly, to cover an absence due to parental leave. And unlike Turley, Peterson, and outfielder, is playing very well. Not only does he have a .298 era, he is 8th in the Pacific Coast League in on base percentage and tied for 8th in runs scored. There might be more to say about the Mormons in the minors this week if so many weren’t on the disabled list. A week ago Bryan Harper and Mitch Talbot were on the 7-day list, and this past week they were joined by Cale Iorg and Mitch Maier. And only Harper seems ready to return to play. And while they are out, there isn’t too much to focus on.The best performance was from Jacksonville Suns’ pitcher Matt Neil, who gave up just 1 earned run in 5 innings, but failed to earn hist first win of the year when his team lost the game after he left the field. Neil has brought his era down to 4.79 and seems to have settled down to his standard pitching form, we hope. If there is a Mormon “Cinderella” player this year, it sure looks like it is Shane Peterson. After starting last year in AA, working his way to AAA, Peterson was invited to spring training and promptly tore up the ball, hitting .408 over 39 at bats and making a big impression on the Athletics brass. 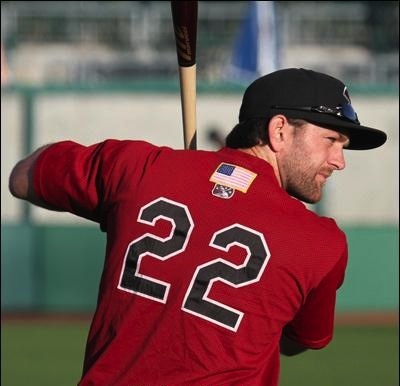 He started the regular season with the AAA Sacramento River Cats, and by last week he was again beating up the white spheroid, going 14 for 27 (.519) and scoring 9 times. So when the As were hit with injuries at shortstop and left field, they called up the outfielder Peterson—and had him play first base yesterday! Huh? Apparently its temporary. The As regular first baseman, Brandon Moss, is out on paternity leave, and since Peterson has experience at 1st (64 games in AA in 2011) and was hitting better than the backup first baseman, Nate Freiman (current batting average .176), he got the job. What will happen next? I assume it depends on how Peterson adjusts and performs. Yesterday he went o for 4 with a strike out, but the As won the game and Peterson performed well in the field, so he has at least a few games—till Moss returns—to prove himself. While this past week Peterson outperformed any other Mormon in the minor leagues, he wasn’t the only player making a difference at the plate. With the Billings Mustangs’ loss last night to the Missoula Osprey, Jeff Gelalich is out of the Pioneer League playoffs, leaving the number of Mormons in the Minor League playoffs at 6. Gelalich didn’t play in the game. But in the first round of the 5-game PCL playoffs, both Mormon players did play, as the playoff teams evened up their series to 1-1. Stephen Parker was 0 for 3 with 2 strike outs, but his Sacramento River Cats won anyway to even their series against the Reno Aces. Mitch Maier was 1 for 4 with a strike out in the Omaha Storm Chasers’ loss to the Albuquerque Isotopes. Pitching in the second game of the Canadian’s three game series to represent the West division in the Northwest League Championship, Taylor Cole pitched 6 innings, giving up 5 hits and seeing just 1 run cross the plate. Cole struck out 3, walked 3 and ended up with a 0.00 era due to a fielding error. Among those he faced was the Everett Aquasox’ Marcus Littlewood, who went 1 or 3 with a walk and a strike out. Due to the Canadians’ win, Littlewood’s season ends, while Cole waits to see who wins today’s game between the Yakima Bears and Boise Hawks. The Canadians play the winner of today’s game in the Northwest League’s 3-game championship starting Friday, Sept. 7th.